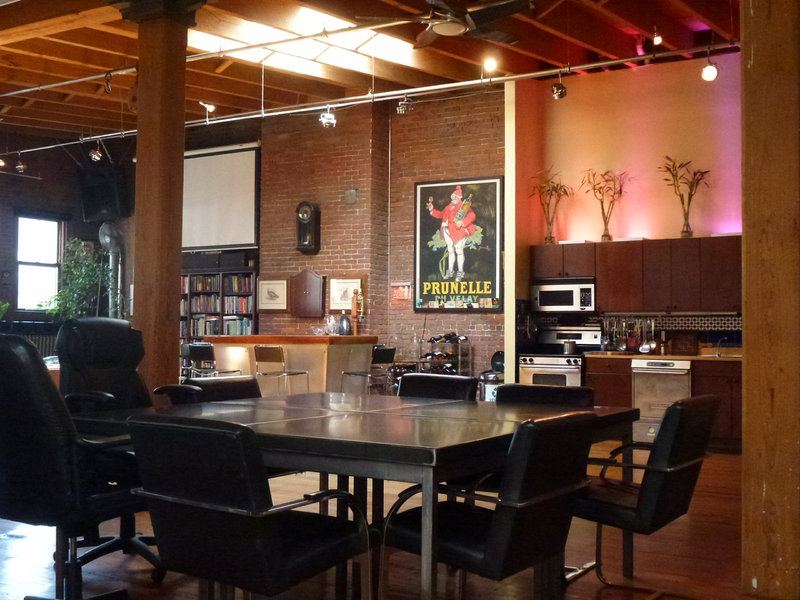 Rent Boston Private Loft | Corporate Events | Wedding Locations, Event Spaces and Party Venues. Private large open Loft in downtown Boston. Located in an elevator building near Boston South Station area. The space gets lots of natural sunlight in the daytime with 19 windows and skylights. Is is ideal for corporate events, Classes, Video / Photo shoot. •	The room has 4 modular metal tables, which can be configured in many ways including a large conference table, or seating for 16 people with 4 per table. •	You can have significant event cost savings by arranging your own food and beverage options. •	The space is equipped with robust Audio and Video Equipment for entertainment or presentations. •	The room has high-speed 100MB Internet, and private Wi-Fi. •	The loft has a built-in bar with seating for 9. •	There are approximately 40 seats in total. •	Additional seating can be arranged upon request. •	The large kitchen has all the usual appliances, glassware, and an industrial dishwasher. The rental price is $250/hour for up to 25 people. The rental price is $400/hour for 25-99 people. There is a 3 hour minimum rental.